Presentations often contain slides with bulleted lists. Here's a quick way to convert the text in a bulleted list to a SmartArt graphic to show your message visually in PowerPoint. A SmartArt graphic is a visual representation of your information that you can fully customize. When converting your text to a SmartArt graphic, you can choose from many built-in layouts to add visual appeal to your information. Place your pointer over a thumbnail to experiment with the layouts for SmartArt graphics that work best with bulleted lists. After you select a layout for a SmartArt graphic, the text in your slides is automatically put in shapes and arranged based on the layout that you chose. You can then customize the SmartArt graphic by changing its color or by adding a SmartArt Style to it. Note: You can also convert pictures on your slide to a SmartArt graphic. 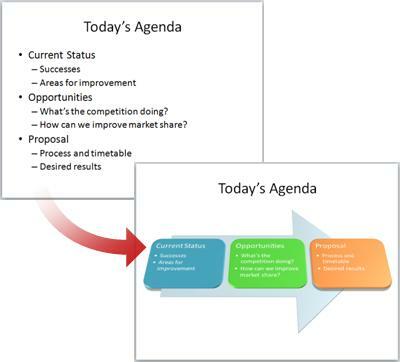 For Office 365 subscribers, PowerPoint Designer recommends conversion of text to a SmartArt graphic when it encounters suitable content on a slide. On the Design tab of the ribbon, select Design Ideas. On the Home tab, in the Paragraph group, click Convert to SmartArt . The gallery contains layouts for SmartArt graphics that work best with bulleted lists. To view the entire set of layouts, click More SmartArt graphics at the bottom of the gallery. 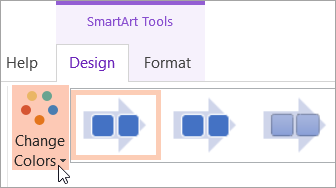 You can convert your SmartArt graphic back to text by right-clicking the graphic and selecting Convert to Text. 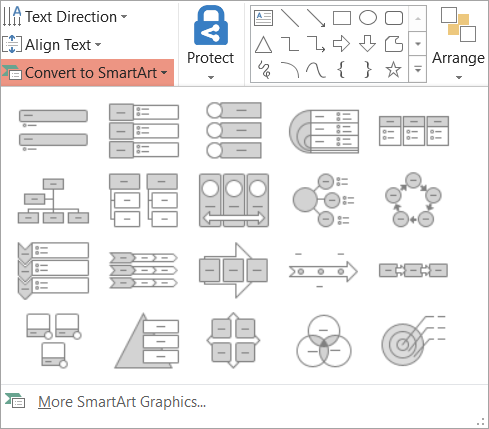 If you don't see the SmartArt Tools or Design tabs, make sure that you've selected a SmartArt graphic. You may have to double-click SmartArt graphic to select it and open the Design tab.